Markell Pipkins stands out on campus for his classic, dressed-up style. Photos by Adam Cvik. For Butler senior Markell Pipkins, a quote from cultural icon Mae West serves as the inspiration for how he styles his clothes. “Too much of a good thing is wonderful,” West said. With Pipkins’ gaudy rings, big fur coats and timeless style, the quote comes to life through his outfits. The Butler Collegian: How would you describe your personal style? 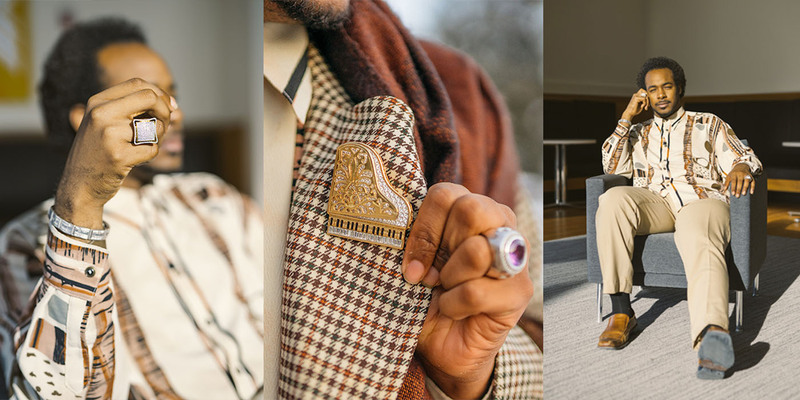 Markell Pipkins: If I had to describe my personal style, it would be a new take on dressing. When I first started dressing up regularly, I was in high school. I would wear collared shirts tucked into nice slacks, which I still do when I am wearing a suit. Now I look into different alternatives of dressing up, which is usually a nice silk shirt, polyester shirt, or a sweater and some slacks throughout the week. TBC: Who and what influenced your personal style? MP: My grandmother raised me and my older brothers, so I always paid a lot of attention to my fashion. When I graduated high school, I had a good relationship with the choir teacher at the time, and he also loved fashion. Those two people helped me come into my own sense of style. TBC: How does your style differ from other students at Butler? MP: I will go to a class where most of my classmates are business students, and they will wear a suit, while I try to reserve a suit for just Sunday morning when I play at church. I also have classes with friends who just wake up and throw on a hoodie and sweatpants, and I do not even wear those kinds of clothing around the house, so it is wildly different from what I wear. TBC: How has your style changed over time? MP: I started dressing differently in high school. I went to Indianapolis Public Schools, and we were switched to a uniform system. I was thinking, ‘I don’t want to look like everyone else.’ So I looked at the handbook and looked at what I could get away with wearing with it still being technically in the dress code. I found a clause saying if you dress up, you can wear whatever you want, so I got rid of all of the polo shirts and started buying long-sleeved, collared shirts, nice ties, and I would slap on a vest and loafers. That kind of became the style of the time for me. I have kind of stayed the same and now dress in more sleek, high-end men’s couture. TBC: When looking for inspiration for your style, do you look at current trends, or do you stray away from trends? MP: If I am wearing a suit, I do look at what is popular now. Not necessarily as a ‘what to do,’ but a ‘what not to do.’ I will look into GQ Magazine and look for color schemes. The thing that I have always seen is that trends change, and I want a closet full of things that will never go out of style. TBC: Where are your favorite places to get clothing? MP: Oh, you’re going into my secrets now! One of my very favorites — I would call it Indy’s best kept secret — is Newman & Co. in Broad Ripple. It has gently-used, nice men’s clothing for less than you would buy them brand new. I also go to Midland Antique Market that is downtown. I usually will get accessories, and it is absolutely fabulous. I get all of my furs and coats from Elan Furs near Keystone. TBC: What is your favorite part of the outfit that you are wearing right now? MP: It would have to be my rings. I always wear two rings every day. One on both of my ring fingers. I also try to wear a diamond bracelet everyday, sometimes two. As far as rings go, I always say ‘big and gaudy.’ I don’t look for any kind of ring. It has got to be a statement ring that has to be sterling silver. TBC: What advice would you give students that want to step away from trends and create their own unique style? MP: Listen 100 percent to your conscience because that is the first thing that will respond when you see clothes. When you go shopping, try to resist the urge of buying what everyone is wearing around campus, unless it is truly what you like. Go out and seek what is true to you. I see what people wear, and it usually mirrors their personality. Do not try mirroring someone else’s personality. Look for you.